Construction on Old Red Courthouse originally began in March of 1890. Designed in the Richardson Romanesque style by M. A. Orlopp to serve the city of Dallas, Texas, by 1920 the two prominent features of the structure (a bell tower and grand staircase) were removed. Through the years Old Red survived at least one attempt to demolish it and suffered countless remodeling. Eventually the original beautifully ornamented interior was hidden from view and appreciation. 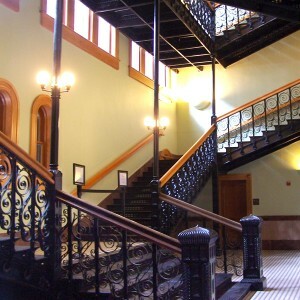 The restoration included replacing the ornate cast stairwell by Robinson Iron. 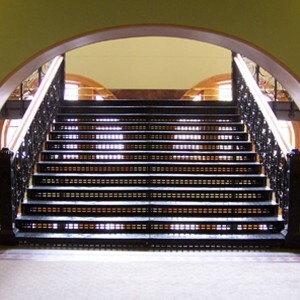 The single historic cast iron stair was cataloged, removed, restored and reconfigured with new cast and wrought material to form a Grand Three-Story Twin Staircase. Robinson Iron’s skills in restoration included cast newels and support columns replicated in cast iron, involving new pattern work with corresponding core boxes. 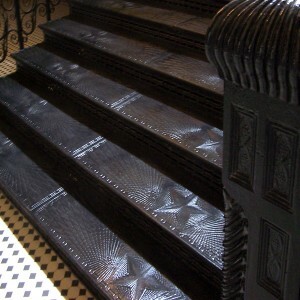 The custom cast iron treads and risers form the wide central stair and all new wrought materials were formed by traditional forging/crimping techniques. Old Red now serves as the home to the Old Red Museum of Dallas County History & Culture, a celebration of the dynamic story of Dallas County.